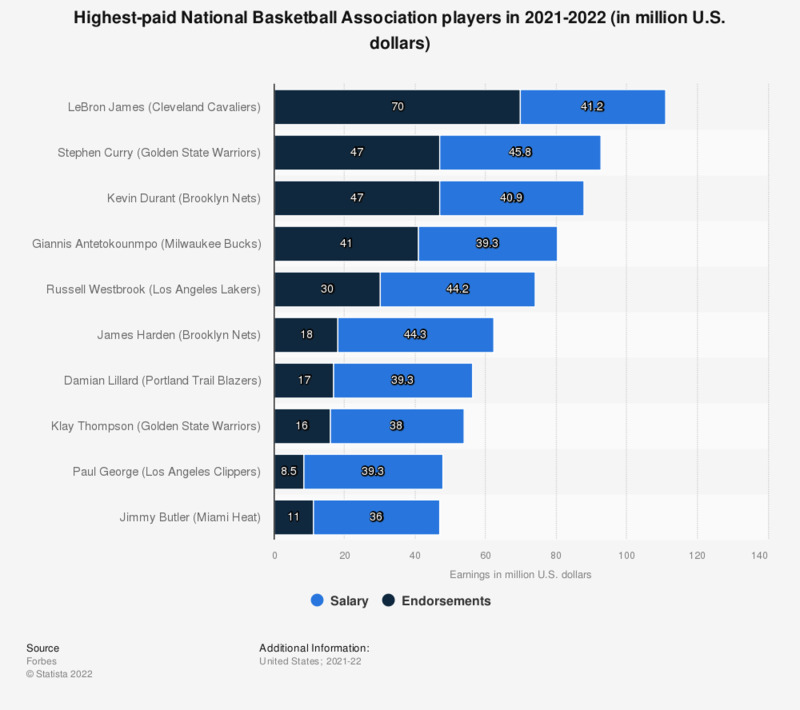 The graph shows the top-ten NBA players in terms of earnings (salary & endorsement deals) in 2019. LeBron James was the top-earning player in the National Basketball Association in 2019, with a salary of 35.7 million U.S. dollars and around 53 million U.S. dollars in off-court income. NBA players have two main sources of revenues: salary from the team and endorsements. NBA players not only have deals with sports brands such as Nike and Adidas, but also with brands such as Coca-Cola, Panini, Kia Motors, Red Bull, to name a few. Shoe deals are particularly profitable for NBA players. Michael Jordan, for example, still profits from endorsements, as its signature shoes have a large share of the basketball shoe market. Thanks to endorsements, L.A. Lakers’ LeBron James is the highest-paid NBA player in 2019. During that year, James’ earnings stood at 88.7 million U.S. dollars, and about 60 percent of his earnings were generated from endorsements. Some of James' endorsements include Nike, Coca-Cola, Beats By Dre, Blaze Pizza and 2K Sports. Golden State Warriors' Steph Curry was the second highest-paid NBA player, with a salary of 37.5 million U.S. dollars and 42 million U.S. dollars in income from endorsement deals.